STAR Wars tragic James Robertson's dark side was brought to light when Harrison Ford stepped onto the red carpet at the Sydney Opera House. Seeing his idol in the flesh was nigh on a religious experience for Mr Robertson, who has followed the film franchise for as long as he can remember. He opened up about his fascination over a Hungry Jack's burger after the meet and greet was over and Ford had been hustled away for publicity interviews. "I just went in (dressed) as a sith lord," he said. "One of the best things about Star Wars is the villains. "I mean they're so bad, they're awesome." 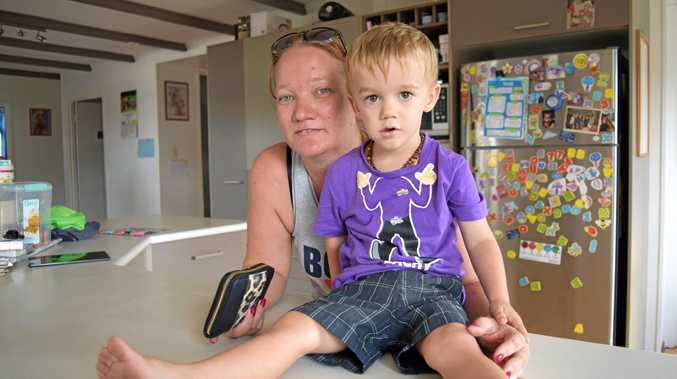 The Star Wars bug first latched onto the Sydneysider he was three, and its pincers have held on tight ever since. "It's been, what, around 32 years I'd imagine," he said. He was almost lost for words when asked for advice for young padawans who were yet to experience his favourite space opera. "Once you see a bit of Star Wars, I mean, you'll be going 'Wow'," he said. 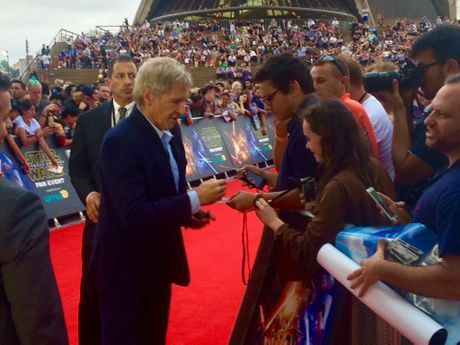 Harrison Ford did the rounds outside the Opera House on Thursday night with the Harbour Bridge as a backdrop, posing for selfies with fans and signing autographs before settling into an on-stage question and answer session. Interviewer Jay Laga'aia, of Playschool fame, also had minor roles in Star Wars Episodes II and III as Captain Typho. "After the three (films) we did, I never anticipated coming back 30 years later to do another," Ford told the crowd. Mr Laga'aia came back with a real doozy: "Why did you? Was it because you needed the money?" The Han Solo actor, whose net worth is estimated at $210 million, looked him dead in the eye. "No, I was glad to come back. "I saw the script and I thought the script was good, and J.J. Abrams is a director that I have long admired, and I did a movie with him about 25 years ago. "And I was convinced that there was an audience for it, and here they are." Ford assured fans the new film would not disappoint. "You know what? It's a really good ride," he said. "And there's some really substantial emotional exercise involved, and I think if you put those two together, you get a winner." When asked who would win a comedy battle between Han Solo and his other famous character, Indiana Jones, Ford ran into some trouble with his words. Older members of the crowd sniggered when he suggested it would have to end in a vigorous "joke off". After all the international publicity tours are over, Ford said he would begin filming the next instalment of Blade Runner. "We have a really good script, and a good story, a good director ... I start that in fall next year," he said. Star Wars: The Force Awakens opens in Australian cinemas on Thursday (December 17).